I had a lot of fun giving stuff away yesterday through Twitter, thought I would continue today. 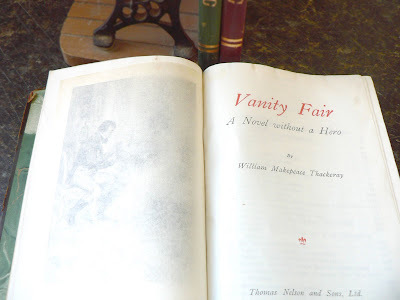 Nice vintage copy of "Vanity Fair" published by Thomas Nelson and Sons, circa 1900. Part of the New Century Library series, which featured smaller sizes and thinner paper. Also included in the giveaway will be the four leaf clover featured in this post from a few days ago. You know I had to give that one away today - if not now, when? Before we get started, yes, I'll ship it anywhere, for free. Alabama, Switzerland, New Zealand, Texas... you get the picture. As for the rules, I don't want to make you all jump through hoops, nor can I figure out some savvy contest that will pull in web traffic all day. I don't give stuff away for that reason, so here are the simple contest rules: Just leave a comment on why you'd like this item, or why you enjoy Forgotten Bookmarks, or what you think can make the site better. I'll pick the winner from the comments section somewhat at random (I have a 1-10 number in mind, whoever posts in that particular spot will win). That's it. I have a backup prize just in case things go haywire. ONE more thing... I will check the comments around noon or so (Eastern US), I have some bookstore work that can't wait. UPDATE: Hey, great response. The number I had in mind was 3 (the number of posts I was hoping for) so good job everyone, you exceeded my expectations. I'll try and post another giveaway tomorrow if time allows. preludetochaos, I will message you on twitter. i like peeking in on people. what can i say. preludetochaos - well I figured I would try again :). This is a fun site. I enjoy seeing the new posts on twitter. I like the site because I imagine that people either put things carefully into their books to keep them safe, because they meant a lot to them, or they did so carelessly as a bookmark perhaps with whatever they had on hand. So each find is something equally important from a distant and maybe forgotten life - something treasured and even secret, or some of the day to day ephemera of our lives that means nothing but nonetheless was useful and necessary at some point and tells you a fact about that person. Where they were, what they thought, what they found important. Whether the item was special or ordinary to the original owner of the book, when it comes to us it's a small artifact to be puzzled and marveled over - it's important now because perhaps in many instances it might be the only thing to transcend and survive and travel from that person's life and find new momentary meaning or be an object of curiosity in another. I love the hints into people's lives - it's like tiny mysteries. And even better - tiny mysteries in a book! 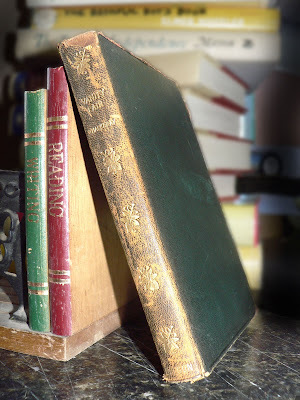 I love old things-especially books and anyhow, the wee faeries led me here. To be quite honest, I came because I saw there was a half-naked picture. There, I said it. I work at a library so I can relate to the stuff you find. Our stuff is pretty much way not as cool, though. AW CRAP! I TOTALLY MISSED IT! I say #4 gets the back-up prize.